My interest in American cars started a long time ago. As a kid, I had toy American cars, and as I grew up I owned quite a few. A 1976 Corvette, a 1981 Corvette, a Ford Explorer and many Jeeps My story does not however concern the past or the old Corvettes, but more the later years and my current two cars, both Jeep Cherokees Our story begins about two years ago when I had a wish to give it all up and retire at 45, and move to the South of France. At the time, I had a decent job and a decent house and was driving a nearly new Jeep Grand Cherokee. Half of the problem was that there was so much to give up. 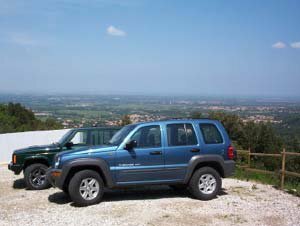 For years though we had owned a holiday home in the South of France, and each time that we came back to England it became harder to say goodbye In an attempt to prepare for the move, I decided that the Grand Cherokee had to go and that something cheaper and smaller would be needed. The garage agreed to patch up the "horse holes" and fix the dent and a deal was done. The Orvis then spent the next 18 months doing many 2500 mile round trips to France towing a trailer and all my worldly goods. The final trip was perhaps the most amusing with literally everything that was left piled into or onto the Orvis including its trailer and three bikes on a bike rack plus wife and three children. If it didn't get in on that trip, then it didn't go! We made it, but the car had suffered badly needing new diff bearings and suspension arms. 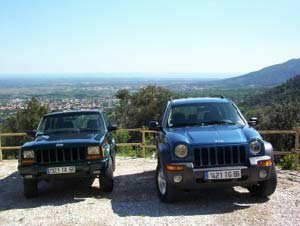 The local Jeep dealer was excellent, although quoted 2 months for the repairs…"Nobody works in France in July or August, Monsieur" I was told! 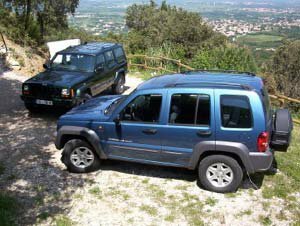 Our house here is on the top of a steep hill so we bought in a 15 year old Polo to tide us on but realised that good transport was a must Back we went to the Jeep dealer in Perpignan and after much haggling (in French!) with salesman Milko, a deal was struck on a new Cherokee 2.8 auto. We had always planned to part exchange the Orvis but with it being RHD there was no interest whatsoever in France. Milko decided that the new car should arrive on Valentine's Day and it duly did, complete with orchids, champagne, champagne glasses and full tank On the way home, the water in fuel light came on. Off we went straight back to Jeep a week later when we were passing next, where a courtesy car awaited and the car was fixed 2 hours later and returned with full tank again! The first service came up and I was told that the cost of oil and filter would be invoiced but not labour. Later that day, the car was ready but there was no bill…the garage said it was a little present from them!! The Jeeps are both fine, and life here is pretty good. My only advice to anyone out there who is harbouring a dream, however big or small, is to go for it and worry about the consequences in the next world! !